I haven't really thought about the power of the word "think" in Philippians 4:8 before. It is because of the importance of our thought lives that Paul said, "Finally, brothers, whatever is true, whatever is noble, whatever is right, whatever is pure, whatever is lovely, whatever is admirable—if anything is excellent or praiseworthy—think about such things" (Philippians 4:8). As Christians we are no longer to be conformed to the pattern of this world but we are to be renewed in our minds (Romans 12:1-2; Ephesians 4:23; 1 Peter 1:14). Holiness begins in our minds and works out to our actions. This being true, what we allow to enter our minds is critically important. 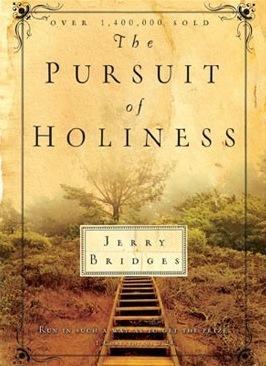 From chapter twelve of The Pursuit of Holiness by Jerry Bridges. A farmer plows his field, sows the seed and fertilises and cultivates - all the while knowing that in the final analysis he is utterly dependent on forces outside of himself. He knows he cannot cause the seek to germinate, nor can he produce the rain and sunshine for growing and harvesting the crop. For a successful harvest, he is dependent on these things from God. Yet the farmer knows that unless he diligently pursues his responsibilities to plow, plant, fertilise and cultivate, he cannot expect a harvest at the end of the season. In a sense he in in a partnership with God, and he will reap its benefits only when he has fulfilled his own responsibilities. We say just as accurately that the pursuit of holiness is a joint venture between God and the Christian. No one can attain any degree of holiness without God working in his life, but just as surely no one will attain it without effort on his own part. God has made it possible for us to walk in holiness. But He has given to us the responsibility of doing the walking; he does not do that for us. From the preface of The Pursuit of Holiness by Jerry Bridges. God does not require a perfect, sinless life to have fellowship with Him, but He does require that we be serious about holiness, that we grieve over sin in our lives instead of justifying it, and that we earnestly pursue holiness as a way of life. There is a lot to love about this book. Secondly, Bridges outlines a whole host of sins that we may not even recognise in ourselves. Am I tempted to think that I have given every part of my life over to God? Needing to think again. Here is the list of the sins Bridges covers - ungodliness, anxiety and frustration, discontentment, unthankfulness, pride, selfishness, self-control (lack there of), impatience and irritability, anger, judgmentalism, envy, jealousy, sins of speech and worldliness. Thinking I don't have a problem with any/some/most of these? Bridges drills down below the surface and turns up all sorts of every day examples that I hadn't even thought of...and that is why they are "respectable sins" - the sins we tolerate to the point that we cease to recognise them as sinful. Sounding like a fun book? Keep reading. Thirdly, Jerry Bridges has a very strong grasp of God's sovereignty. A loving sovereign God. This book provides sound and solid teaching on God's sovereignty alongside the teaching on sin. Worth reading to be moved once again by God's sovereignty. Which leads to the fourth - this book is pastoral. 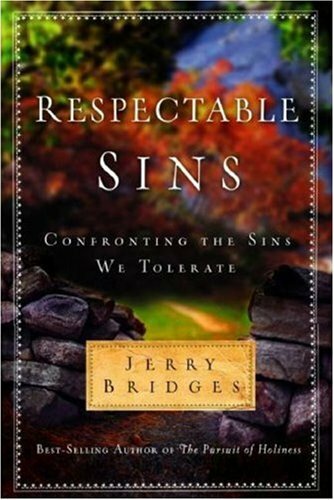 Ligon Duncan, in his commendation for Respectable Sins said, "Jerry Bridges has blessed us with this timely book designed to help us grow in grace and glorify and enjoy God as we ought. I can't think of any partner with whose help I'd rather tackle my own heart sins than Jerry." And he is right. I felt like someone was holding my hand and leading me ever so gently through the pages of this book. I couldn't put it down. I couldn't wait to read the next chapter. I felt sad when it came to an end. A book that was exposing sin after sin. That is gifted writing. And that is the wonder of being one of God's children. Sinful but saved. I felt encouraged (in the best sense of the word) to take a long, hard look at myself, and confident to do so because the God I long to love and serve with all my heart, soul, mind and strength has loving sovereignty over my life. He has numbered my days and even the hairs on my head. He loves me so much that He sent His only Son to die for me to take the punishment for all that sin. Why wouldn't I want to tackle this sinfulness given the hope found in the cross of Jesus, given to us by a sovereign and loving God. Sin is a spiritual and moral malignancy. Left unchecked, it can spread through our entire inner being and contaminate every area of our lives. Even worse, it often will "metastasize" from us into the lives of other believers around us. None of us lives on a spiritual or social island. Our attitudes, words and actions, and oftentimes even our private unspoken thoughts, tend to have an effect on those around us. Paul must have had this concept in mind when he wrote, "Let no corrupting talk come out of your mouths, but only such as is good for building up, as fits the occasion, that it may give grace to those who hear" (Ephesians 4:29). Our speech, whether it is about others or to others, tends to tear down or build up. It either corrupts the minds of our hearers, or it gives grace to them. Such is the power of our words. If I gossip, I both tear down another person and corrupt the mind of my listener. If I complain about the difficult circumstances of my life, I impugn the sovereignty and goodness of God and tempt my listener to do the same. In this way, my sin "metastasizes" into the heart of another person. From Respectable Sins by Jerry Bridges, page 23. That moment when I finished my first ever set of school reports, drove straight to a friend's house, put on my tape (yes...cassette tape) of Mozart's Clarinet Concerto and sank into her sofa to the strains of that perfect first movement of the perfect concerto, a huge job behind me and knowing that writing school reports would never be THAT hard again...relaxation. That moment when I sipped the cup of tea - Harrod's Elderflower and Champagne Tea, no less - served in a fine bone china cup and saucer...bliss. That moment when I had breakfast out at a restaurant ON A SCHOOL DAY and then came home and danced around the house to "Forever Young" (The Corrs version) because it was the first day of my long service leave...glee. That moment when I realised, in the dark back streets of Bologna, that I had walked myself off my map having read it upside down...lost. That moment when I came out of the electrical goods store with my first vacuum cleaner...grown up. That moment when the real estate agent said our offer on the house had been accepted and no, there weren't going to be counter-offers and counter-counter-offers and yes, the house (and the mortgage) was ours...disbelief. And slight queasiness. That moment when I came up the escalator to the waiting area to catch the plane with 20 school children in my charge behind me and saw the faces of all the other adults also waiting to catch that plane drop as they saw the 20 children who would be joining them on the flight...mirth. That moment when those twenty children, none of whom had ever caught a plane before, let out a collective squeal as the plane took off...priceless. That moment when I played the whole of the Mozart Flute Concerto, accompanied by an orchestral backing track, completely from memory...sublime. That moment when, a day later, I played that concerto and three other substantial pieces for a flute exam and failed...gutted. That moment when I surveyed the contents of my car boot - the things gathered in the moment of forced decision on being evacuated against the threat of bushfire - defining. That moment when I prayed to God and said yes, I wanted to live my life fully under His authority - freedom, and the most important moment. This is my post for Prompted to Write on the topic of "That Moment When..." If you would like to join in and write a post on this topic (and take it where you want to) go here for instructions on how to participate. Running: a bit late because of the Prompted to Write post yesterday. And looking forward to seeing how it all unfolds. Drinking: tea. Decaf tea. And it is OK.
Reading: Leviticus, Psalms in the 40s, Proverbs 10 and Mark. Also reading: Communion with God by John Owen. Well, perhaps reading is a somewhat loose term. I have the bookmark in at the beginning of the fourth chapter and it's been there for quite a while. Made a good start and felt myself resting into God's goodness, sovereignty, love, might and power. But reading time has been somewhat elusive this last week or two. Watching: Lost in Austen. It's great viewing - a wonderful companion on ironing nights. And having read Pride and Prejudice lately, all the more clever than the last time I watched it. Pondering: over one of the most useful things I read on the internet last year (well, it is the thing that has stuck and it's a shame that I can't remember where I read it) - that when young people aren't towing the line, as it were, they may be needing evangelism rather than discipleship. Telling a young person that what they are doing isn't honouring to God (or whatever language you want to use) could well be met with eye rolling (or worse) if they haven't apprehended the good news of Jesus for themselves. They need evangelism, not discipleship. Great wisdom. Feeling: oh so very fit. Well, a bit fitter than I was a month ago, having joined a gym when school went back. One of those 24/7 ones with no classes, not many staff (or staffed hours), just lots of machines that they house and maintain. There are some machines that I WILL NEVER USE and I said so to the man who was giving me the guided tour. In the end he got the drift and was saying, "Now this one, well, we won't bother with that one because you probably won't be using it." And of one in particular he said, "Now, don't ever use this one. There are others that will achieve the same things and you are better off using them. This one will be plain dangerous for you." I was more than happy to hear him say that. And am happily riding the exercise bike (10km at level five) and rowing the rowing machine (1km at level 10.) It's a start. I've probably done more exercise in February than I did last year. Convinced: that day time television is TERRIBLE. I don't watch TV. At all. Especially during the day. (I watch DVDs when I do the ironing and we watch an episode of Bear Grylls each week as a family, but that is all.) But at the gym I have been channel surfing with the little screen on the bike. And I have concluded that day time television is dreadful. It is easy to see how shut ins and stay at homes who turn to the television for company can become depressed. Going to start listening to music and sermons from now on. Chuffed: with my cooking efforts. Went in with a blaze of glory and introduced six new recipes within ten days. Especially loving Donna Hay's fish poached in tomato and basil. And pork san chow boy is excellent but it is important to follow the recipe regarding the amount of ginger. Everyone has taken to new foods well. However I peaked too quickly and didn't try anything new during February. So it is probably time to pull out the books and find some more recipes to try before I get stuck in a new cooking rut. Thankful: to God for all the things, big and small, that He has given me to fill my days. And thankful day by day for strength and health to do them.